Thirty-four-year-old Hu Jia has long been active in a series of human rights causes. Starting with advocacy for rural AIDS sufferers, Hu also campaigned for democratic rights, religious freedom, and self-determination for Tibet. The sentencing, coming only weeks after the Chinese crackdown on demonstrations in Tibet, indicates that Beijing is sticking to a hard-line despite its promise to improve its human rights record when it won the right to stage the 2008 Olympic Games. Hu’s lawyer Li Fangping pointed out that the case against him relates to comments made seven years ago — material which presumably has been available to the authorities for years, but only acted upon now. “What he is being charged with today are his speeches made between May 2006 and October 2007, with his views expressed in five articles and two interviews,” Li said. “Our defense is that the speeches were made in 2001, with its formal legal proceedings starting on August 2006. Besides that, those speeches were not publicly distributed [at the time]. Nicholas Bequelin, of the U.S.-based rights group Human Rights Watch, told the French AFP news agency that “without the Olympics, [Hu] would not be in jail.” His sentencing is meant to discourage others from speaking out. A prominent activist who publicised human rights abuses across China has been convicted of subversion and jailed for three-and-a-half years. 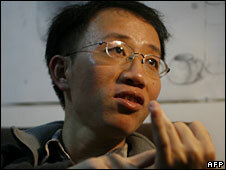 Mr Hu’s conviction comes only two weeks after another activist, Yang Chunlin, was jailed on similar charges. On Wednesday, UK-based rights group Amnesty International accused Beijing of carrying out a “wave of repression” ahead of the Olympic Games. China is demonstrating it’s insecurity. It is paranoid to feel threatened by old words. This is called obsession … China is blind to how this behavior appears to the world. That’s because it bristles at world scrutiny. China and President Bush have redefined RESOLVE: “Like it or not, I’m gonna do it anyway”.